Pramod is one of the first business leaders in the country to bring about a transformation in the knowledge industry. Thanks to him, General Electric (GE) is today a business case study. In his talks, Pramod shares his vast experience as a leader, handling adverse situations in the dynamic business environment of India, and how to manage a diverse workforce. An industry champion, an entrepreneur and a thought leader—Pramod is one of the pioneers who steered India’s rise as a knowledge economy. Having spent 25 years in GE in tenures spanning the US, Europe and Asia, he built the GE Capital business in India from ground-up and has inked strategic partnerships for the growth of the business. 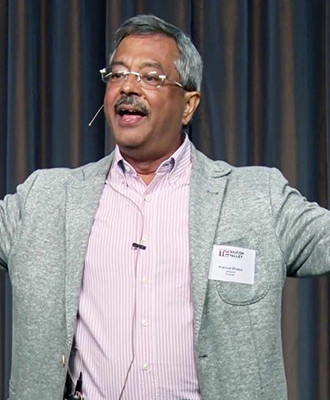 In 1997, Pramod founded Genpact, formerly GE Capital International Services, and set the ball rolling for the concept of business process management. Under his aegis, Genpact grew to lay the foundation of the industry, not just in India, but also in China, Eastern Europe and Latin America. Today, Genpact is a giant with 55,000 employees across 17 countries. In 2011, he stepped back from his position as the President and CEO of Genpact to take on a mentoring role as its Vice Chairman.